Have you ever thought about what happens to plastic after you throw it away? If you have, maybe you just assumed that it was recycled and reused…at least, as much as possible. Well, the thing about plastic is that it is much cheaper to manufacture it than to recycle it. This means that only a small percentage of all plastic that is created gets recycled, and even then, it is usually only reused in a degraded form that will still be quickly disposed of again. One of the supposedly convenient things about plastic goods is that they do not breakdown, and so they are long-lasting. Well, is this really what you want from your (mostly) single-serving plastic goods: to never breakdown or biodegrade? The future of your local lake or river? Plastic is created chemically in laboratories and cannot be broken down by any natural processes. It can and will tend to break up into smaller and smaller pieces that become invisible to the naked eye, but it will still remain constituted as an unnatural and toxic element in the environment. So where does it all go? 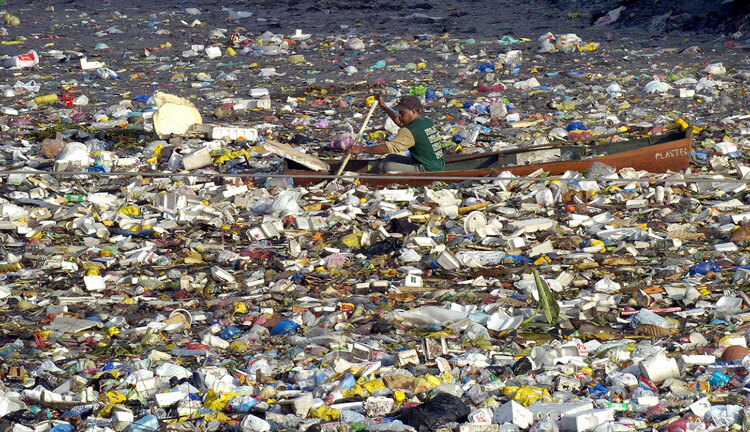 Well, there is something called the Great Pacific Garbage Patch. Plastic makes up 90% of the trash in the oceans, and obviously almost all of it comes from land. Current patterns in the ocean create areas of natural calmness, called gyres, where things like trash tend to end up a few weeks or months after being making their way into your local river or lake. The total area of the Pacific garbage patch is one and a half times bigger than the USA. Over one million sea birds and 100,000 sea mammals or turtles die everyday due to ingesting toxic plastic in the waters or becoming entangled in plastic waste. As horrible as this is, even worse is the fact that there is 45 kilos of trash for every 1 kilo of plankton. Plankton is one of the most important organisms on the planet because it is at the bottom of the food pyramid and, directly or indirectly, the source of food for an enormous quantity of life. Whenever you eat fish, there is a significant chance that you will be ingesting some of the toxic chemical residue of plastic yourself. We all know plastic has made life easier and more convenient, and has led to advancements in technology in every field. This is an indisputable fact. The problem is not with the many useful applications of plastic, but with its disposal. 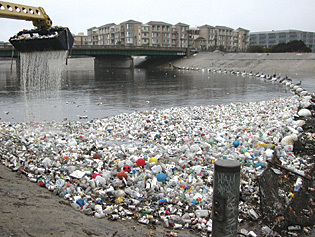 Plastics have only become an everyday fact of life since after WWII, a period of roughly 60 years. Imagine how much plastic has been produced in this relatively short period of time, and then imagine that none of it will biodegrade in anything less than 1000 years (but maybe much, much more). It has become so cheap to make and to use, that it has become ubiquitous in most everything we purchase. We rarely pay any attention to using something one time and throwing it away, not concerned with what happens next because we will never see it again. Well, that trash does not disappear, but continues to linger in the environment. 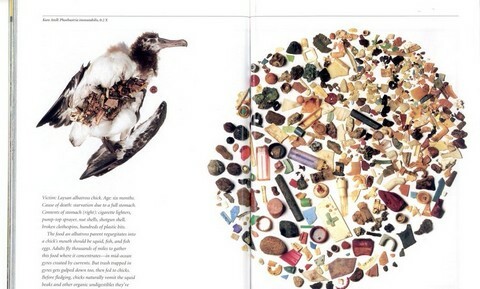 All the plastic on the right was taken from this bird’s stomach. What can we do? The most obvious initial steps to take are to completely stop using plastic bags from any shop, and to stop buying or using plastic water bottles (if you haven’t done so already). These two things are among the most widespread single-serve plastic goods, and are also highly symbolic of the rampant waste of the whole affair. It should be quite easy to make a one-time investment in a cloth grocery bag (or use a backpack like I do), and a durable, outdoor-type water bottle. These things are even more stylish! Tell everyone you know to do the same, and do not hesitate to chastise anyone, be they friend or foe, when you witness their oblivious abuse and waste of plastic bags and bottles. Next, examine the packaging in all the products you buy and think about if the extra, ever-present layers of various types of plastic is really necessary. Do not be afraid to withhold your business from companies that still refuse to use more natural and efficient packaging, and make sure that everyone you know does the same. Turtle trapped inside plastic ring (still alive in New Orleans). Among the worst of many images you can find with a quick Google search. Recycle everything! First and foremost, this means do not even think about getting rid of something unnecessarily, just to get a bigger and better newer model. Use things as long as they will last, and then find a new use for them. Reuse containers indefinitely. Get involved and motivated about recycling things in general that cannot be reused, and find information about what happens to your recycled goods. There is lots of information about these things available, and each community has different practices. If there is only minimal recycling in your area, do everything you can to change this immediately. Everyone inherently wants to recycle–it is only ignorance or indifference that stops them from doing so. If anyone has any other links or information about ways to help, please post them in the comments (and tell everyone you know!). There are many ways we can start getting more involved in improving our planet and home (it’s our only one! ), so why not start with this one? Have fun. Go shopping. Just make the right choices and your baby’s children’s pet goldfish will be alive to see the sunlight too. Uy, thought I was making a post on Facebook to connect to this link…Anyway, great post, thank you. Really makes you think about our choices. The garbage patch makes me sick just thinking about it.